The Beacon Hill Nursery School summer program is a 10-week creative learning adventure for children aged 2 years to 7 years old. Children engage in group activities that are designed to stimulate intellectual growth, independence, and social skills within an atmosphere that is informal, nurturing and enriching. The summer program facilities provide for both indoor and outdoor activities. 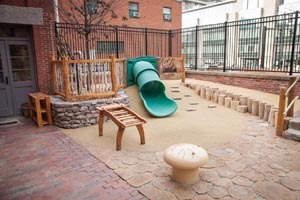 Two large on-site play spaces are used daily for climbing, sliding, and water play. Classrooms, a library, kitchen, lunchroom, and an air-conditioned gymnasium allow for a broad range of creative indoor activities.